This article is about the area in Scotland. For the musical instrument, see Fife (instrument). For other uses, see Fife (disambiguation). 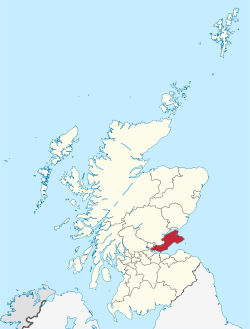 Fife ([ˈfəif]; Scottish Gaelic: Fìobha) is a council area and historic county of Scotland. It is situated between the Firth of Tay and the Firth of Forth, with inland boundaries to Perth and Kinross and Clackmannanshire. By custom it is widely held to have been one of the major Pictish kingdoms, known as Fib, and is still commonly known as the Kingdom of Fife within Scotland. Fife is Scotland's third largest local authority area by population. It has a resident population of just under 367,000, almost a third of whom live in the three principal towns of Dunfermline, Kirkcaldy and Glenrothes. Fife, bounded to the north by the Firth of Tay and to the south by the Firth of Forth, is a natural peninsula whose political boundaries have changed little over the ages. The Pictish king list and De Situ Albanie documents of the Poppleton manuscript mention the division of the Pictish realm into seven sub-kingdoms or provinces, one being Fife, though this is now regarded as a medieval invention. :70–72 The earliest known reference to the common epithet The Kingdom of Fife dates from only 1678, in a proposition that the term derives from the quasi-regal privileges of the Earl of Fife. :132 The notion of a kingdom may derive from a misintrepretation of an extract from Wyntoun. :133 The name is recorded as Fib in A.D. 1150 and Fif in 1165. It was often associated with Fothriff. The hill-fort of Clatchard Craig, near Newburgh, was occupied as an important Pictish stronghold between the sixth and eighth centuries AD. Fife was an important royal and political centre from the reign of King Malcolm III onwards, as the leaders of Scotland gradually moved southwards away from their ancient strongholds around Scone. Malcolm had his principal home in Dunfermline and his wife Margaret was the main benefactor of Dunfermline Abbey. The Abbey replaced Iona as the final resting place of Scotland's royal elite, with Robert I amongst those to be buried there. The Earl of Fife was until the 15th century considered the principal peer of the Scottish realm, and was reserved the right of crowning the nation's monarchs, reflecting the prestige of the area. A new royal palace was gradually constructed at Falkland, formerly the stronghold of Clan MacDuff, and was used by successive monarchs of the House of Stuart, who favoured Fife for its rich hunting grounds. King James VI of Scotland described Fife as a "beggar's mantle fringed wi gowd", the golden fringe being the coast and its chain of little ports with their thriving fishing fleets and rich trading links with the Low Countries. Wool, linen, coal and salt were all traded. Salt pans heated by local coal were a feature of the Fife coast in the past. The distinctive red clay pan tiles seen on many old buildings in Fife arrived as ballast on trading boats and replaced the previously thatched roofs. In 1598, King James VI employed a group of 12 men from Fife, who became known as the Fife adventurers, to colonise the Isle of Lewis in an attempt to begin the "civilisation" and de-gaelicisation of the region. This endeavour lasted until 1609 when the colonists, having been opposed by the native population, were bought out by Kenneth Mackenzie, the clan chief of the Mackenzies. Fife became a centre of heavy industry in the 19th century. Coal had been mined in the area since at least the 12th century, but the number of pits increased ten-fold as demand for coal grew in the Victorian period. Previously rural villages such as Cowdenbeath rapidly swelled into towns as thousands moved to Fife to find work in its mines. The opening of the Forth and Tay rail bridges linked Fife with Dundee and Edinburgh and allowed the rapid transport of goods. Modern ports were constructed at Methil, Burntisland and Rosyth. 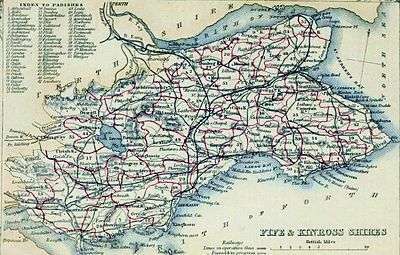 Kirkcaldy became the world centre for the production of linoleum. Postwar Fife saw the development of Scotland's second new town, Glenrothes. Originally to be based around a coal mine, the town eventually attracted a high number of modern Silicon Glen companies to the region. Fife Council and Fife Constabulary also centre their operations in Glenrothes. There are numerous notable historical buildings in Fife, some of which are managed by the National Trust for Scotland or Historic Scotland. They include Dunfermline Abbey (the last resting place of Scottish royalty), the palace in Culross, Ravenscraig Castle in Kirkcaldy, Dysart Harbour area, Balgonie Castle near Coaltown of Balgonie, Falkland Palace (hunting palace of the Scottish Kings), Kellie Castle near Pittenweem, Hill of Tarvit (a historical house), St. Andrews Castle, St. Andrews Cathedral and St. Rule's Tower. Fife is represented by five constituency members of the Scottish Parliament (MSPs) and four members of the United Kingdom parliament (MPs) who are sent to Holyrood and the British Parliament respectively. Since the 2015 General Election, all four of the MPs constituencies have been held by the Scottish National Party. Four of the Scottish Parliament constituencies are held by the Scottish National Party: Cowdenbeath, Dunfermline, Fife Mid and Glenrothes and Kirkcaldy. One is held by the Scottish Liberal Democrats: North East Fife. Fife Council's administrative headquarters and Police Scotland's P Division (formerly Fife Constabulary) are based in Glenrothes. The Council meetings take place in Fife House (formerly known as Glenrothes House) in the town centre. The west wing of the building was built by the Glenrothes Development Corporation (GDC) as their offices in 1969, which was later used as the headquarters of Fife Regional Council. 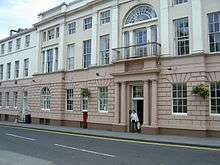 The former administrative seat was Cupar. Since the last Scottish election in 2012, Fife Council has been run as a minority by the Labour party, with a total of 35 seats, with support of Tory and independent councillors. Alex Rowley was elected leader of Fife Council but demitted office following his election as an MSP. David Ross succeeded as leader in February 2014. The SNP and the other parties form the opposition. Notably, on Fife council sits the only communist to hold elected office in the United Kingdom. Fife is a peninsula in eastern Scotland bordered on the north by the Firth of Tay, on the east by the North Sea and by the Firth of Forth to the south. The route to the west is partially blocked by the mass of the Ochil Hills. Almost all road traffic into and out of Fife has to pass over one of three bridges, south on the Forth Road Bridge, west on the Kincardine Bridge or north-east via the Tay Road Bridge, the exception being traffic headed north on the M90. Tolls were abolished on the Tay Road Bridge and Forth Road Bridge on 11 February 2008. There are extinct volcanic features, such as the Lomond Hills which rise above rolling farmland, and Largo Law, a volcanic plug in the east. At 522 metres (1,713 ft), the West Lomond is the highest point in Fife. The coast has fine but small harbours, from the industrial docks in Burntisland and Rosyth to the fishing villages of the East Neuk such as Anstruther and Pittenweem. 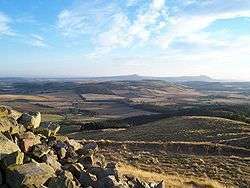 The large area of flat land to the north of the Lomond Hills, through which the River Eden flows, is known as the Howe of Fife. North of the Lomond Hills can be found villages and small towns in a primarily agricultural landscape. The areas in the south and west of Fife, including the towns of Dunfermline, Glenrothes, Kirkcaldy and the Levenmouth region are lightly industrial and more densely populated. The only areas which could claim to be heavily industrial are Rosyth, around the naval dockyard and perhaps the Mossmorran Natural Gas Liquids fractionation plant on the outskirts of Cowdenbeath. The east corner of Fife, generally that east of a line between Leven and St Andrews is recognised throughout Scotland as the East Neuk (or corner) of Fife, small settlements around sheltered harbours, with distinctive vernacular "Dutch" or corbie (crow) stepped gabled and stone-built architecture – an area much sought after as second homes of the Edinburgh professional classes since the Forth Road Bridge was built. The fishing industry on which the East Neuk settlements were built has declined in recent years with the main fishing fleet now operating from Pittenweem and the harbour in Anstruther being used as a marina for pleasure craft. Cupar took over as county town from Crail in the early 13th century. 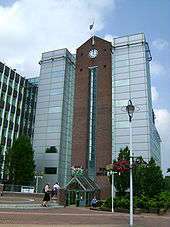 Glenrothes is now the administrative centre, after the decision to locate the headquarters of the newly established Fife Regional Council there in 1975. Fife's three major towns are Kirkcaldy, Dunfermline and Glenrothes. According to the 2012 estimate, Dunfermline is the largest settlement by population, followed by Kirkcaldy then Glenrothes. The next most sizeable towns by population are St Andrews, Cowdenbeath, Rosyth, Methil and Dalgety Bay. The rest of Fife includes smaller towns such as Inverkeithing, Kincardine, Anstruther, Lochgelly, Burntisland, Leven, Newburgh, Tayport and Cupar, and villages such as Springfield, Kinglassie, Kinghorn, Elie, Auchtertool, Crossgates, Ballingry and Auchtermuchty. Fife contains 4,961 listed buildings and 48 conservation areas. Domestic sites of importance include Falkland Palace, Kellie Castle, Dunfermline Palace, St Andrews Castle, Culross Palace and Kirkcaldy's Ravenscraig Castle. Fife has a number of ecclesiastical sites of historical interest. St Andrews Cathedral was home to the powerful Archbishopric of St Andrews, and later became a centre of the Scottish Reformation, while Dunfermline Abbey was the last resting place of a number of Scottish kings. Balmerino and Culross abbeys were both founded in the 13th century by the Cistercians, while a century before Lindores Abbey was founded by the Tironensians outside Newburgh; all were highly important sites. The Stanza Poetry Festival, East Neuk Festival, Pittenweem Arts Festival are events of national cultural importance. Smaller festivals like Cupar Arts Festival also take place. The Byre Theatre in St Andrews and Adam Smith Theatre in Kirkcaldy were both highly regarded as touring venues, the latter also being the base of the grand opera company Fife Opera. The Byre has re-opened in Autumn, 2014 following its going into administration in 2012. St Andrews in Fife is the home of golf, being the town in which the sport was invented, and the Royal and Ancient Golf Club still has responsibility for overseeing the rules of the game today. Fife Flyers are the UK's oldest ice hockey club and play in Britain's top flight, the Elite Ice Hockey League. Fife is also home to eight rugby union clubs. Dunfermline RFC, Fife Southern RFC based in Rosyth, Glenrothes RFC, Howe of Fife RFC based in Cupar, Kirkcaldy RFC, Madras RFC, Waid Academy RFC and University of St Andrews RFC - the oldest rugby club in Fife. Fife Lions are the sole rugby league club. Kingdom Kangaroos are Fife's only Australian Rules Football team, with training held in Rosyth and Kirkcaldy. Locally published newspapers include the Fife Free Press in Kirkcaldy; the Dunfermline Press in Dunfermline; the Glenrothes Gazette in Glenrothes, the East Fife Mail in Leven, the Fife Herald in Cupar / Howe of Fife and the St Andrews Citizen in St Andrews. DC Thompson publishes Fife and West Fife editions of the Dundee Courier & Advertiser, and the Counties Edition of the Evening Telegraph is sold in Fife. The only Fife-based radio station is Kingdom FM. There is also a community radio station that broadcasts each evening and is run solely by youths, called Fife Youth Radio. Other local radio stations, Radio Tay and Edinburgh's 97.3 Forth One, broadcast to the northern and southern parts of the region respectively. 1 2 Complete Atlas of the British Isles. Readers' Digest. 1965. p. 218. 1 2 3 Taylor, Simon; Gilbert Márkus (2012). The Place-Names of Fife, Volume 5. Donington, Lincs. : Shaun Tyas. ISBN 9781907730085. ↑ "The site record for Clatchard Craig at RCAHMS". Canmore.rcahms.gov.uk. ↑ "Excavation Summary by the Society of Antiquaries of Scotland" (PDF). ↑ "A Dictionary of Scottish Phrase and Fable". google.co.uk. ↑ "MPs of Fife". Parliament UK. Retrieved 1 August 2015. ↑ "Scotland Election 2016". BBC News. ↑ Ferguson A History of Glenrothes p.91. ↑ Geoghegan, Peter (11 January 2015). "Britain's last elected communist: 'I was always rebellious'". the guardian.com. The Guardian. Retrieved 30 August 2015. ↑ "Mid 2012 population estimates of settlements" (PDF). Archived from the original (PDF) on 27 October 2014. ↑ "Fife's listed buildings". Historic Scotland. Retrieved 25 August 2009. ↑ "Byre Theatre to reopen after University of St Andrews agree rescue package". Herald Scotland. ↑ "Byre Theatre in St Andrews board 'deeply regrets' closure". BBC News. 26 January 2013. Retrieved 21 October 2013. ↑ "The Courier - British Newspapers Online". Wikisource has the text of the 1911 Encyclopædia Britannica article Fife (Scotland). Wikimedia Commons has media related to Fife. Wikivoyage has a travel guide for Fife.